Meza-Joya F. L, E. Ramos-Pallares & C. Hernández-Jaimes, 2019. Hidden diversity in frogs within Boana calcarata-fasciata and Boana geographica species complexes from Colombia. Herpetology Notes, (12): 391-400. Ospina-Sarria, J. J., & W. E. Duellman. 2019. Two new Species of Pristimantis (Amphibia: Anura: Strabomantidae) from southwestern Colombia. Herpetologica 75: 85–95. Guayasamin, J. M., D. F. Cisneros-Heredia, J. Vieira, S. Kohn, G. Gavilanes, R. L. Lynch, P. S. Hamilton, and R. J. Maynard. 2019. A new glassfrog (Centrolenidae) from the Chocó-Andean Río Manduriacu Reserve, Ecuador, endangered by mining. PeerJ 7(e6400): 1–23. Jiménez-Bolaño J. D., Montes-Correa A. C., Polo-Córdoba F., Linares-Vargas K., Vergara-Gil D, Barrio-Amorós C. L. & Koch C. 2019 Acoustic repertory of the “Colostethus” ruthveni group (Anura: Dendrobatidae) and comments on the distribution in the Sierra Nevada de Santa Marta, Colombia. SALAMANDRA 55(1):27-38. Mendoza A.M., Bolívar-García W., Vázquez-Domínguez E., Ibáñez R., Parra Olea G..2019. The role of Central American barriers in shaping the evolutionary history of the northernmost glassfrog, Hyalinobatrachium fleischmanni (Anura: Centrolenidae) PeerJ7:e6115 https://doi.org/10.7717/peerj.6115. Acosta-Galvis, A. R. J. W. Streicher, L. Manuelli, T. Cuddy & R. O. de Sá. 2018. Molecular insights into the phylogenetic placement of the poorly known genus Niceforonia Goin & Cochran, 1963 (Anura: Brachycephaloidea). 4514(4):487-500. Thompson M.E., Medina-Rangel G.F., Ruiz-Valderrama D.H. 2018 First record and massive range extension of Hyalinobatrachium cappellei (Van Lidth de Jeude, 1904) (Anura, Centrolenidae) in Colombia. Check List 14 (6): 945–949. Marín-Castaño, C. M., C. Molina-Zuluaga, A. Restrepo, E. Cano & J. M. Daza. 2018. A new species of Leucostethus (Anura: Dendrobatidae) from the eastern versant of the Central Cordillera of Colombia and the phylogenetic status of Colostethus fraterdanieli. Zootaxa 4461: 359–380. Acosta-Galvis, A. R. & M. Vargas-Ramírez. 2018. A new species of Hyloxalus Jiménez De La Espada, 1871 ‘‘1870’’ (Anura: Dendrobatidae: Hyloxalinae) from a cloud forest near Bogotá, Colombia, with comments on the subpunctatus clade. Vertebrate Zoology, 68(2): 123–14. Duarte-Marin, S., González-Acosta, C., & Vargas-Salinas, F. 2018. Estructura y composición de ensamblajes de anfibios en tres tipos de hábitat en el Parque Nacional Natural Selva de Florencia, Cordillera Central de Colombia. Revista de la Academia Colombiana de Ciencias Exactas, Físicas y Naturales, 42(163), 227-236. Acosta-Galvis, A. R. & A. Pinzón, A. 2018. Una nueva rana nodriza (Anura: Dendrobatidae) de los bosques de niebla asociados a la cuenca del Orinoco de Colombia. Biota Colombiana, 19 (Sup. 1): 160-190. Acosta-Galvis, A. R. 2018.Una nueva rana de huesos verdes del género Scinax (Anura: Hylidae) asociada a los bosques subandinos de la cuenca del río Magdalena, Colombia. Biota Colombiana, 19 (Sup. 1): 131-159. Acosta-Galvis, A. R., C. A. Lasso and M. A. Morales-Betancourt. 2018 First record of Boana maculateralis (Caminer & Ron, 2014) and Boana tetete (Caminer & Ron, 2014) (Anura, Hylidae) in Colombia. Check List 14 (3): 549–554. https://doi.org/10.15560/14.3.549. Rojas-Runjaic, F. J., Infante-Rivero, E. E., Salerno, P. E., & Meza-Joya, F. L. 2018. A new species of Hyloscirtus (Anura, Hylidae) from the Colombian and Venezuelan slopes of Sierra de Perijá, and the phylogenetic position of Hyloscirtus jahni (Rivero, 1961). Zootaxa, 4382(1), 121-146. Acosta Galvis A.R. & de Sá RO 2018 Leptodactylus validus Garman, 1888 in Colombia: its distribution and identification. ZooKeys 737: 113-123. Viuche-Lozano, A., Enciso-Calle, M. P., & Bernal, M. H. 2018. The advertisement call of Centrolene notostictum (Anura, Centrolenidae) with a new record of geographic distribution in Tolima, Colombia. Zootaxa, 4377(4), 575-576. Acosta-Galvis, A. R. 2017. Batracofauna de los bosques de niebla y estribaciones del piedemonte en el municipio de Yopal, (Casanare), Orinoquia colombiana. Biota Colombiana 18 (1): 281-314. Enciso-Calle, M. P., A. Viuche-Lozano, M. Anganoy-Criollo, & M. H. Bernal 2017. Rediscovery of Atelopus subornatus Werner, 1899 (Anura: Bufonidae), with a redescription of the tadpole. Zootaxa, 4344(1):160-162. Jungfer, K. H. 2017. On Warszewicz’s trail: the identity of Hyla molitor O. Schmidt, 1857. SALAMANDRA, 53(1):18-2. Cabanzo-Olarte, L. C., & Ortega-Chinchilla, J. E. 2017. Advertisement Call of the Glass Frog Espadarana andina (Anura: Centrolenidae).Herpetological Review,48(3):514-516. Carvajalino-Fernández, J. M., M.F. Porras, J. E. Ortega-Chinchilla & L. Barrientos 2017. Vocalizations of an Endangered Species: Description of Release Calls of Atelopus nahumae, an Endemic Species from the Masiff Sierra Nevada de Santa Marta (Colombia). Herpetological Review, 48(2), 273-275. Rada, M., J. J. Ospina-Sarria & J. M. Guayasamin, 2017 A Taxonomic Review of Tan-Brown Glassfrogs (Anura: Centrolenidae), with the Description of a New Species from Southwestern Colombia. South American Journal of Herpetology, 12(2):136-156. Rada M., A. M. Jeckel, V. Z. Caorsi, L. S. Barrientos, M. Rivera-Correa & Taran Grant. 2017 A Remarkable New White-Eyed Glassfrog Species of Sachatamia from Colombia (Anura: Centrolenidae), with Comments on the Systematics of the Genus. South American Journal of Herpetology, 12(2):157-173. Meneses-Pelayo, E., W. Chinchilla-Lemus & M. P. Ramírez-Pinilla. 2017 Filling gaps and update of the distribution of Strabomantis ingeri (Cochran & Goin, 1961) (Anura: Craugastoridae) in Colombia. Check List 13 (4): 17–20. Meza-Joya, F. L., C. Hernández-Jaimes & E. Ramos-Pallares. 2017. A New Species of Salamander (Caudata, Plethodontidae, Bolitoglossa) from Serranía de los Yariguíes, Colombia. Zootaxa. 4294(1); 93–111. from the Urabá region of Colombia. Zootaxa. 4290 (3): 531–546. Malambo, C., J. F. González-Ibarra & Y. C. Gomez-Polania 2017. Rediscovery of Centrolene solitaria (Anura: Centrolenidae) from Colombia. Phyllomedusa: Journal of Herpetology, 16(1), 97-99. Vargas-Salinas, F., A. M. Ospina-L., J. A. Rios-Soto,and M. Rivera-Correa. 2017. Centrolene savagei, Catalogue of American Amphibians and Reptiles 912:1-12. Murphy, J. C., Sierra, T. A., Downie, J. R., & Jowers, M. J. 2017. Toads, tall mountains and taxonomy: the Rhinella granulosa group (Amphibia: Anura: Bufonidae) on both sides of the Andes. Salamandra, 53(2), 267-278. Rivera-Correa, M., Vargas-Salinas, F., & Grant, T. 2017. Statistical differences and biological implications: a comparative analysis of the advertisement calls of two Andean stream treefrogs (Hylidae: Hyloscirtus) and the evolution of acoustic characters. SALAMANDRA, 53(2), 237-244. Gonzáles-Durán G.A., M. Targino, M. Rada & T. Grant, 2017 Phylogenetic relationships and morphology of the Pristimantis leptolophus species group (Amphibia: Anura: Brachycephaloidea), with the recognition of a new species group in Pristimantis Jiménez de la Espada, 1870. Zootaxa 4243 (1): 042–074. Molina-Zuluaga C. , Cano, E. , Restrepo A , Rada M. & Daza J.M. 2017 Out of Amazonia: the unexpected trans-Andean distribution of Cochranella resplendens (Lynch and Duellman, 1978) (Anura: Centrolenidae).Zootaxa 4238 (2): 268–274. Restrepo, A., Velasco, J. A., & Daza, J. M. (2017). Extinction risk or lack of sampling in a threatened species: Genetic structure and environmental suitability of the neotropical frog Pristimantis penelopus (Anura: Craugastoridae). Papéis Avulsos de Zoologia (São Paulo), 57(1), 1-15. Orrico, V. G. D., I. Nunes, C. Mattedi, A. Fouquet, A. W. Lemos, M. Rivera-Correa, M. L. Lyra, D. Loebmann, B. V. S. Pimenta, U. Caramaschi, M. T. Rodrigues & C.F. B. Haddad. 2017 Integrative taxonomy supports the existence of two distinct species within Hypsiboas crepitans (Anura: Hylidae). Salamandra 53(1):99-113. Acevedo-Rincón, A. A., M. Lampo, and R. Cipriani. 2016. The cane or marine toad, Rhinella marina (Anura, Bufonidae): two genetically and morphologically distinct species. Zootaxa 4103: 574–586. Acosta Galvis, A.R., C. A.Lasso & M. Morales.2016 Ranas del género Pipa (Anura: Pipidae) de la Orinoquia colombiana: nuevos registros y comentarios sobre su taxonomía, distribución e historia natural.Biota Colombiana 17 (2):98-109. Muñoz-Arcos, R., Guerrero-Cupacán, J. A., & Cepeda-Quilindo, B. 2016. First record of Pristimantis crucifer Boulenger, 1899 (Anura: Craugastoridae) from Colombia, Nariño Department. Check List, 12(6), 2021. Valencia-Zuleta A., A. F. Jaramillo-Martínez & M. H. Yánez-Muñoz, 2016 Redescription, distribution and mating call of Pristimantis colomai (Lynch and Duellman, 1997) (Anura, Craugastoridae). Zootaxa 4193 (3): 590–594. Ron, S. R., Venegas, P. J., Ortega-Andrade, H. M., Gagliardi-Urrutia, G., & Salerno, P. E. 2016. Systematics of Ecnomiohyla tuberculosa with the description of a new species and comments on the taxonomy of Trachycephalus typhonius (Anura, Hylidae). ZooKeys, 630, 115. Buitrago-González, W. J. H. López-Guzmán & F. Vargas-Salinas 2016 Anuros en los complejos paramunos Los Nevados, Chilí- Barragán y Las Hermosas, Andes centrales de Colombia.Biota Colombiana 17 (Suplemento 2 - Páramos):52-74. Cruz, E. X., Galindo, C. A. & Bernal, M. H. 2016 Dependencia térmica de la salamandra endémica de Colombia Bolitoglossa ramosi (Caudata, Plethodontidae). Iheringia, Sér. Zool.106:1-5. Rivera-Correa, M. & J.M. Daza. Molecular phylogenetics of the Pristimanstis lacrimosus species group (Anura: Craugastoridae) with the description of a new species from Colombia. Acta Herpetologica 11(1): 31-45. Gutiérrez-Cárdenas, P. D. A., Castillo, K., Martínez, D., Rocha, C. F. D., & Rojas-Rivera, M. A.2016. 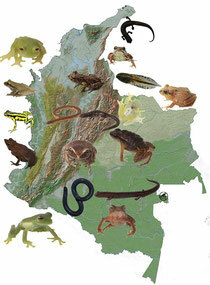 Trophic Ecology of Pristimantis labiosus (Anura: Craugastoridae) from South-Western Colombia. North-Western Journal of Zoology, 12(1), 102-109. Kahn, T.R., E. La Marca, S. Lotters, J.L. Brown, E. Twomey and A. Amézquita, Eds. 2015. Aposematic Poison Frogs(Dendrobatidae) of the Andean Countries: Bolivia, Colombia, Ecuador, Peru and Venezuela. Conservation International Tropical Field Guide Series, Conservation International, Arlington. USA. xxiii + 588pp. Díaz-Pulido, A., A.R. Acosta Galvis, X. Albarán- Montoya, Anganoy-Criollo, Marvin, Cáceres, F. Guerrero C., Guevara-Molina C., Moreno-Arias, R. y Pérez Villota J. Anfibios. 259-270 p. En Barriga, J.C. Díaz-Pulido, A. Santamaría M. y H. Garcia (eds.) 2016 Catalogo de la biodiversidad de las Regiones, andina, pacifica y piedemonte amazónico. Nivel local. Volumen 2, Tomo 2, Serie Planeación Ambiental para la Conservación de la Biodiversidad en áreas operativas de Ecopetrol.Instituto de Investigaciones científicas Alexander von Humboldt, Ecopetrol S.A. Bogotá D.C 423 p.
Buitrago-González, W., J. H. López-Guzmán, & F.Vargas-Salinas, 2016. Niceforonia adenobrachia Ardila-Robayo, Ruiz-Carranza & Barrera-Rodríguez, 1996 (Amphibia: Anura: Craugastoridae): extension of geographical distribution in the Central Andes of Colombia. Check List, 12(1), 1845. Valencia-Zuleta, A., Jaramillo-Martínez, A. F., Cardona-Botero, V. E., & Castro-Herrera, F. 2016. Geographic extension of Ecnomiohyla milaria (Cope, 1886)(Anura: Hylidae) for Colombia. Herpetology Notes, 9:23-26. Acosta-Galvis, A.R. 2015.Una nueva especie del género Pristimantis (Anura: Craugastoridae) del complejo de páramos Merchán-Iguaque (Boyacá, Colombia).Biota Colombiana 16 (2):107-127. Gonzáles-Durán, G. 2016. A new small frog species of the genus Pristimantis (Anura: Craugastoridae) from the northern paramos of Colombia. Zootaxa 4066(4):421-437. Ospina-Sarria, J. J., T. Angarita-Sierra, & R. Pedroza-Banda 2015. A New Species of Craugastor (Anura: Craugastoridae) from the Magdalena River Valley, Colombia, with Evaluation of the Characters Used to Identify Species of the Craugastor fitzingeri Group. South American Journal of Herpetology 10(3):165-177. Heinicke M.P., C. L. Barrio-Amorós & Hedges S. B., 2015 Molecular and morphological data support recognition of a new genus of New World direct-developing frog (Anura: Terrarana) from an under-sampled region of South America. Zootaxa 3986 (2): 151–172. Blanco-Torres A, M. Duré & M.A. Bonilla 2015. Observaciones sobre la dieta de Elachistocleis pearsei y Elachistocleis panamensis en dos áreas intervenidas de tierras bajas del norte de Colombia. Revista Mexicana de Biodiversidad 86 (2015) 538–540. Acosta-Galvis, A. R., C. A. Lasso y M. A.Morales-Betancourt. 2014. Nuevo registro del cecílido Typhlonectes compressicauda (Duméril & Bibron1841) (Gymnophiona: Typhlonectidae) en la Amazonia colombiana. Biota Colombiana 15 (Supl. 1): 118-123. Ron S. R. , J. J. Mueses-Cisneros, P. D. A. Gutiérrez-Cárdenas, A. Rojas-Rivera, R. L. Lynch, C. F. Duarte Rocha & G. Galarza. 2015 Systematics of the endangered toad genus Andinophryne (Anura: Bufonidae): phylogenetic position and synonymy under the genus Rhaebo. Zootaxa 3947 (3): 347–366. Jaramillo-Martinez, A. F.,A. Valencia-Z., V. E. Cardona, F. Castro-Herrera & D. F. Cisneros-Heredia. 2015. Range extension of Cochranella mache Guayasamin and Bonaccorso, 2004 (Anura: Centrolenidae) with comments on the distribution of C. euknemos (Savage and Starrett, 1967) in Colombia. Herpetology Notes 8:161-163. Rueda-Solano, L. A., Vargas-Salinas F. & Rivera-Correa M. 2015. The highland tadpole of the harlequin frog Atelopus carrikeri (Anura: Bufonidae) with an analysis of its microhabitat preference. Salamandra 51(1):25-32. Guayasamin, J. M.,Krynak, T., Krynak, K., Culebras, J., Hutter, C. R.. 2015. Phenotypic plasticity raises questions for taxonomically important traits: a remarkable new Andean rainfrog (Pristimantis) with the ability to change skin texture. Zoological Journal of the Linnean Society. 173:913-928. Ospina-Sarria J.J., D.A. Velásques Trujillo & W.Bólivar-G. 2015. First records of the twoo poorly know Terrarana frogs Pristimantis esmeraldas (Guayasamin,2004) and Strabomantis necerus (Lynch, 1975) (Amphibia Anura Craugastoridae) for Colombia. Herpetology Notes, 8 27-30. Granda–Rodríguez H. D., L. P. Saboyá-Acosta A. Del Portillo-Mozo & J. M. Renjifo. 2014 Range extension of dendrobatid frog Colostethus ruthveni Kaplan, 1997 (Anura: Dendrobatidae) in the Sierra Nevada de Santa Marta, Colombia. Check List 10(3): 674–676. Osorno Muñoz M. , D. L. Gutiérrez-Lamus, & J. C. Blanco. 2011. Anfibios en un gradiente de intervención en el noroccidente de la Amazonia colombiana. Revista Colombia Amazónica (4) :143-160. Solano, L., Lizcano, D. & Mercado-Gómez, J. 2015. Selección de sitios de llamado de la rana Neotropical Hypsiboas crepitans. Revista Biodiversidad Neotropical 5(1):71-75. Tolosa, Y., Molina-Zuluaga, C., Restrepo, A., & Daza, J. M. 2015. Madurez y dimorfismo sexual de la ranita cohete Colostethus aff. fraterdanieli (Anura: Dendrobatidae) en una población al este de la Cordillera Central de Colombia. Actualidades Biológicas, 37(102), 287-294. Perdomo-Castillo, I. V., & J. J. Mueses-Cisneros. 2014. Ampliación del ámbito de distribución geográfica de Hypsiboas nympha (Amphibia: Anura: Hylidae) en Colombia. Herpetotropicos. Mérida, Venezuela 10: 33–35. Rivera-Prieto D. A., Rivera-Correa, M. & Daza J. M.A 2014 new colorful species of Pristimantis (Anura: Craugastoridae) from the eastern flank of the Cordillera Central in Colombia.Zootaxa 3900 (2): 223–242. Moreno-Barbosa, S. E., & Hoyos-Hoyos, J.M. 2014. Ontogenia de la dieta de anuros (Amphibia) colectados en la rivera del río La Vieja en el departamento de Quíndio (Colombia). Caldasia, 36(2), 365-372. Peloso, P. L. V., M. J. Sturaro; M. C. Forlani, P. Gaucher, A. P. Motta & W. Wheeler. 2014 Phylogeny, taxonomic revision, and character evolution of the genera Chiasmocleis and Syncope (Anura, Microhylidae) in Amazonia, with descriptions of three new species. Bulletin of the American Museum of Natural History, (386):1-112. Acevedo Rincón A.A., R. F. Pallares & K. S. Perez 2014 Nuevos registros de especies del género Pristimantis (Anura: Craugastoridae) para el nororiente de Colombia. Revista Biodiversidad Neotropical 4(2):162-169. Méndez-Narváez, J., J. O. Ortiz-Navia, & W. Bolívar-García. Hypsiboas pugnax Schmidt, 1857 and Scinax ruber Laurenti, 1768 (Amphibia: Anura): Distribution extension in the Río Cauca Valley, Colombia . Check List. Journal of Species Lists and Distribution 10: 409–410. García-R., J. C., A. M. Mendoza, O. Ospina, H. Cardenas, & F. Castro. 2014. A morphometric and molecular approach to define three closely related species of frogs of the genus Pristimantis (Anura: Craugastoridae) from the Cordillera Occidental in Colombia. Journal of Herpetology 48: 220–227. De Sá, R.O., Grant, T., Camargo, A., Heyer, W.R., Ponssa, & M.L., Stanley, E. 2014. Systematics of the Neotropical genus Leptodactylus Fitzinger, 1826 (Anura: Leptodactylidae): Phylogeny, the relevance of non-molecular evidence, and species accounts. South American Journal of Herpetology 9: s1-s128. Grant T, Bolivar-G W 2014 A new species of semiarboreal toad with a salamander-like ear (Anura: Bufonidae: Rhinella). Herpetologica 70:198-210. Construcción enero 2013;actualización octubre 2013; octubre 24 2014; 5 de febrero de 2015; Julio 17 de 2015;22 de Agosto, 2015.